During the annual Worldwide Developers Conference (WWDC) today, Apple announced an extension of its iOS mobile operating system for cars. Dubbed iOS in the Car, the feature integrates devices running iOS, such as an iPhone, iPod Touch, or iPad, with a vehicle’s built-in infotainment system. And as partially anticipated, two of General Motors’ brands — Opel and Chevrolet — were listed as brands that will integrate iOS in the Car in 2014. According to Apple, having iOS in the Car built into the vehicle will allow users to connect their iPhone 5 and interact with it using the car’s built-in infotainment display and controls or Siri Eyes Free. To note, General Motors was the first automaker in the industry to integrate Siri Eyes Free in the Chevrolet Spark and Sonic. iOS in the Car knows when the user is leaving home for work — or vice versa — and displays traffic conditions and the ETA. Siri will play back voicemail and return missed calls. The car’s onboard controls can be used to control music, including the newly-announced iTunes Radio streaming music service, audiobooks, podcasts, third-party audio apps, and more. Users can get turn-by-turn directions with Maps. The user has the choice of entering an address or letting iOS in the Car select any address the user received in an email or text. Text messages appear right on the car’s display. Siri can read them out loud over the car’s speakers and users can reply by dictating to Siri. 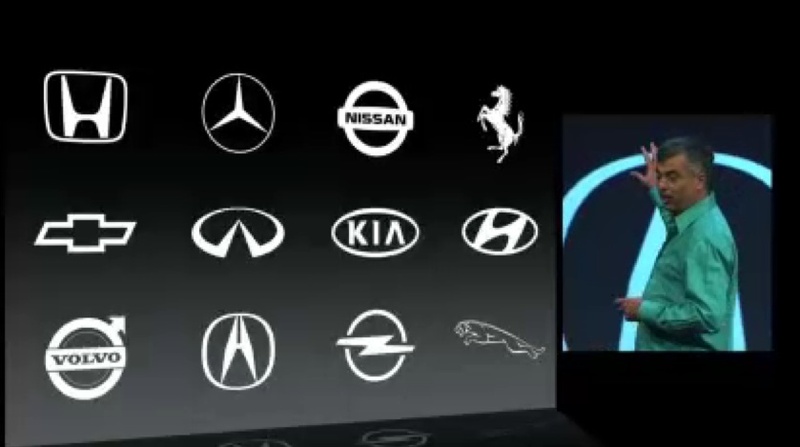 We find it peculiar that Apple only displayed the Chevrolet and Opel logos as the only GM brands with plans to integrate iOS in the Car for 2014. For starters, if Opel is compatible, then so are GMC and Vauxhall — thanks to the common IntelliLink Infotainment System; and by association, if GMC is compatible, then so is Buick. And what of Cadillac and its CUE infotainment system? Apple senior vice president of Internet Software and Services Eddy Cue announces iOS in the Car at the 2013 Worldwide Developers Conference. Notably, Apple is currently using the MyLink infotainment system from the Chevrolet Spark and Sonic to showcase screenshots of iOS in the Car in action. or in another word, why don’t they make it to the rest of the GM? They did just mention the most frequent and most outstanding. OMG! Soon they will have to ban using the car while driving. At least the cars will never show the BSOD that menace Ford cars. But I prefer that GM develop its own OS so it will be smaller, smoother, cleaner, and faster. Most PC OS have many subroutine calls for added functions, making them bulky, slow, and prone to bugs and hacker interference. Cars have lesser functions (most are automated wit no driver interventions), so a simple OS is the best for all cars! Well, GM did develop its own OS with MyLink, CUE, and IntelliLink. They’re based on Linux, but they’re tailored to do specific things and are also upgradable with new features and functionality. I was thinking why didnt GM use android? MyLink is linuxed based so why not run MyLink and Android side-by-side since they’re both linux based. Plus am assuming they run on ARM so this will allow the various car components to interact with them. Android can handle media player, calls, etc. MyLink can take care of the rest. Great, now Apple knows our driving habits, too. Also, anticipate a huge wave of in-car ads. I hope the system was DESIGNED by people actually working IN CARS, unlike MyFord Touch and CUE. Although people might be less distracted by driving if the iOS is easy to use. Let’s hope car companies don’t eschew buttons and knobs just to highlight the “hip, cool” Apple iOS that makes cars “more advanced and an accessory for your phone”. What about other smartphones? Will they still work? And the worst part will be the media field day, finally focusing on what drives America, the car; praising Apple and ignoring the fact that similar systems have been in cars for years. Hopefully, this doesn’t make people buy cars just for the “New, Hip, Apple” feel. Well this is probably going to based on the iPhone 5 and iPad OS, so the requirements will be much lower to run it. So it will be faster in a car because the added space for better processors. The only problem I see with this is the current market of smartphones, most phone users have android phones, now some will switch to an iPhone (not because the car they bought), but most will stick to android. Even former iPhone owners have switched to android. I would have much rather they stick to the Linux based mylink/cue etc. primarily because its ease of programming to accept all other forms of media input whether it be iOS or Android or BB10, much like windows. It does create an advantage of that those that have apple products can now integrate their car into their other apple products, but it puts everybody else on the curb. I believe that this will in turn only cater to a niche of complete apple buyers (those of whom own an iPad Phone and a Macbook in their home), where as everybody else will wish to opt for a basic system, which will not be available to the disgruntled consumer whom does not have such products (or does not have aspirations to purchase as such). Also keep in mind that many businesses may switch back to Blackberry for their business needs and in turn cannot integrate with their car systems, leaving them without a useful tool. True many businesses are switching to iPhone, but many still use Blackberry, and considering how many businessmen buy luxury cars (MBZ Caddy etc.) developing a car based OS from blackberry might have been in their best interest, or sticking with Linux all together. Vauxhall is Opel. The UK will definitely get this feature as well, but I am not sure if the same applies for Buick and GMC. I’m very excited for this. I hope this feature makes its way onto the new Impalas. I think something a lot of people are misunderstanding about this announcement is that the vehicles supporting “iOS in the car” will not actually run iOS as the infotainment OS. iOS will only show up on the vehicle’s display when connected to an iOS device, such as an iPhone or iPad. If you aren’t connected with your mobile device, the vehicle will run its own OS, in this case MyLink or intellelink. It will still work with non-apple devices, just with a little less capability. Correct me if I’m wrong Alex?? Jordan, i hope that’s right. My curiosity is how will this be implemented? I guess my question is anyone that doesn’t have an iPhone 5 (including those iphone 4S and below) will be running around with unusable software? One reason i prefer the Intellilink/Mylink software – it’s not attached to either the Windows, Android, iOS, or any other OS. I am just no longer certain where you stand helping your facts, nonetheless excellent matter. I need to expend a bit discovering far more or perhaps knowing more. Many thanks superb information and facts I had been hunting for this data for my mission. Any hints out there to suggest this will be compatible with 2014 Silverado/Sierra?